Let us help you project YOUR image! We can engrave logos (line drawings only) with a one-time setup charge. (Want a reasonably priced full color logo? See here.) Our years of experience can help you decide on something that'll be just right to provide a solution while conveying a professional and friendly image of your organization. We use durable Rowmark™ 2-ply plastic material. For other choices, see our metal and Snapi Color Tags. Below are our most common 'catalog' items. These are just samples however. Your nametag is custom-made and can be any size/color you prefer. Don't forget to see our Metal Name Badges and our Snapi full-color laminated tags. They're great alternatives! 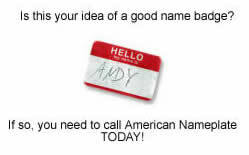 Looking for a nametag for your club or fraternal body? We're the group nametag specialists! Check this page! 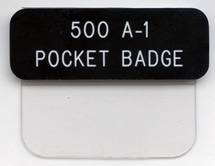 We provide military nametags and nametag solutions for schools and organizations throughout the US. Click here to see more of what we can do for you!